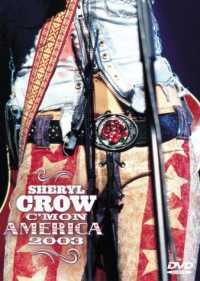 Shot with Sony hi-definition digital cameras over two nights in July 2003 at the Fraze Pavilion in Kettering, Ohio, this two-hour show is a striking improvement in both scale and production values to the Live From London set, released in 1997. Back then, Sheryl Crow was still making her mark on the soft rock scene. Now, with a few chart hits under her belt, and a superb post-millennial CD, C'mon C'mon (which her recent tour promoted heavily), she's aiming for the traditional - yet still illustrious - appeal of USA rock 'n' roll goddess, with stars 'n' stripes costumes and blonde mane catching the breeze, just right, as if the open air setting is just another part of her act's choreography. Steve McQueen begins the show in suitably hard rocking fashion, and is such a strong opener that There Goes The Neighbourhood feels slightly disappointing as a follow-up. There's some belated, anticipatory preamble (atmospheric backstage footage, crew and roadies at work, Crow relaxing - presumably on the lawn at home - with her faithful 'wonder dog' Scout, and snippets of interview) while Riverwide plays in the background. My Favorite Mistake precedes a worthy live version of studio album title track, C'mon C'mon, after which Crow needs help shucking off her red leather jacket. "You can see how hard it is to get me out of my clothes," she quips. Cat Stevens' The First Cut Is The Deepest isn't that surprising a choice for a Crow cover version, and makes a fine addition to this outing. We also get performances of familiar Crow songs - Strong Enough, Redemption Day (illustrated on the stage-set's backing screens by varied philosophical quotations from the usual infamous or celebrated suspects), the crowd-pleasing If It Makes You Happy, relentlessly feelgood classic A Change Would Do You Good, and the initially quieter but eventually rousing Home. Returning briefly to material from her current album, Weather Channel is one of those songs that have aided Crow's great escape from the US pop ghetto; its depth of feeling being incompatible with pop's superficial ideals. Leaving Las Vegas is another darker offering, drawing on the same inspirations as Mike Figgis' 1995 movie. Breaking the mood somewhat, lighter songs All I Wanna Do, Soak Up The Sun, the excellent Everyday Is A Winding Road and You're An Original, lead us towards the encore territory of Let's Get Free, and heartfelt ballad I Shall Believe, but there's no sense of the band winding down yet, as they maintain energy production for the infectious beats of Safe And Sound (clips of WW2 carpet-bombing raids on the projection screens punctuate a parade of despots), and close with Crow dancing barefoot on the baby grand piano for a passable rendition of Led Zeppelin's Rock And Roll. The Region-free DVD has excellent picture quality and the usual choice of Dolby digital audio options, but is sadly lacking in disc extras.